I just learned about a useful tool for keeping an eye on builds in TFS. 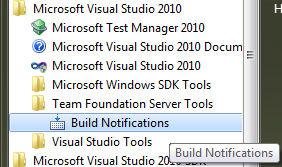 The Build Notifications tool can be accessed from the Start menu under Microsoft Visual Studio 2010 > Team Foundation Server Tools. This tool runs in the task tray. You can configure it with which builds you want to monitor and whether to monitor for just yourself or anyone. You can also configure it to alert you for builds that are queued, started, or finished. With the alerts configured, you’ll receive pop-up notifications each time an event occurs for a monitored build definition. 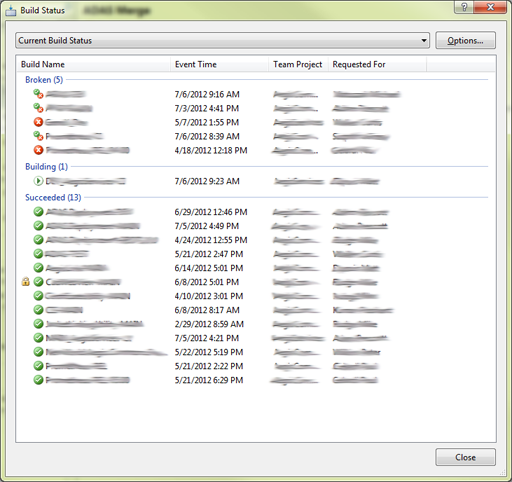 Double-clicking the icon in the task tray brings up the Build Status window which shows you the last build result for each build being monitored. This is a great way to ensure that builds don’t stay broken for too long.